The importance of the brow has not been forgotten as much as it has been overlooked. A natural tool of communication, the brows can convey surprise, disdain, and sorrow with a lift, a furrow, or an expressive softness. The masters of makeup, like Max Factor and Ben Nye, knew the importance of perfectly styled brows, and how that would affect the work of the actors with whom they worked. The secrets to impeccably groomed and maintained brows are not an industry secret. In fact, it's as easy as one-two-three! Step 1 Shape the brows. Whether you are a fan of tweezing or waxing, the first step is to shape the brows. In most instances, the easiest way to create a pleasing shape is to remove extraneous hairs with wax, and then edit the shape, perfecting it, by tweezing. Don't forget that it is the hair on the upper line of brow that defines the arch. These hairs may be edited as well. After combing the brows up, use a pair of scissors to trim the hairs. This will keep the hairs from seeming too long when they are groomed later as a finishing touch. The ideal brow begins directly above the inner corner of the eye, and the tail of the brow can be determined by drawing a line from the corner of nose, crossing the outer corner of the eye, and ending at the brow. The arch should fall naturally between the pupil and the outer corner of the eye. Step 2 Fill in the brows. Using a brow fill powder or airbrush, fill in the brows, creating a soft, pleasing shape. It is important to remember that the brows may not be exact matches, but may be variations of each other. In fact, for the most natural appearance, it is best if the brows are not perfect matches. Step 3 Define the brows with a brow pencil. Finish defining the brows with a brow pencil, using short strokes, as if drawing individual hairs up from the bottom of the shape. Apply a fixative gel or wax, combing the hairs up and toward the end of the brow. Finish the brows by applying a highlighting cream or pencil under the arch of the brow, beginning just in front of the arch, but not from the inner corner of the brow, and blended toward the outer corner of the eye for an instant "brow lift". The finished brows should have a softly defined arch that allows for a wide range of expression. By taking steps to create a shape that is too severe, or too sharply defined, the brows can present a personality or expression that is contrary to the image that you'd like to portray. This applies on camera, on stage, in the boardroom, and even at the grocery store! 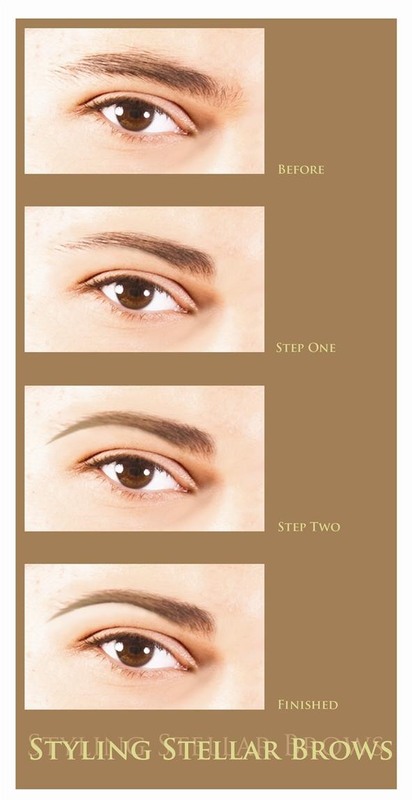 These three steps can be used to effectively style stellar brows.